We Pensters know Cleveland Brown for his great job as the photographer for our group, making a visual documentation of guest speakers, special events, and audience participation. In conducting this interview, Cleve was kind enough to bring me a run-down on his life and activities, especially regarding his photography and writing. He became interested in these areas as a tenth grader at Monroe High School, as reporter and photographer for the FFA chapter. 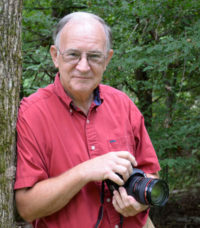 Since retirement, he has devoted more of his time to writing and photography, especially relating to fine art, nature and documentary photography. Three of his photographs have won awards in the Outdoor Alabama Photo Contest: 2014 honorable mention, 2015 2nd place, and 2016 3rd place. During his college years Cleveland received a double major in Religion and English and a double minor in History and Philosophy from Mobile College in 1969, an MS degree from Livingston University. He also has a Class “A” and Class “AA” certification in Marketing and Marketing Education from Auburn University. Many of us may not know that Cleve’s central and abiding calling in life is his dedication to Christian service, accepting Christ as his savior at the age of nine, preaching his first sermon at fifteen, and becoming ordained at the age of nineteen. For more than fifty years, he has served as pastor of various Southern Baptist churches in Monroe, Clark, Conecuh, and Covington counties, and was Director of Missions for the Conecuh County Baptist Association. I think this calling was “in his blood, ” since his third great grandfather was pastor of Old Salem Baptist Church in 1837, a church started in 1817, one of the earliest churches in Alabama. Cleve should conduct a workshop on how he organizes and works on his ideas for poems: he maintains four active files as part his procedure: Finished Poems, Unfinished Poems, An Ideas and Starters file, and a Words file. He has more than 90 poems in his Unfinished category, and his Ideas and Starters file contains more than 300 ideas, quotes, experiences, and information which might be developed into poetry. He is also a song writer and guitar player, singing gospel songs in the churches he attends. His repertoire includes country, rock & roll, folk music, blues and gospel. Cleveland is a member of the Alabama State Poetry Society and has won awards for poems entered in ASPS contests. He also belongs to the Alabama Writers Forum, the Pensters Writers Group, and the Eastern Shore Camera Club in Fairhope, Alabama. He gives credit for his love of poetry to his mother who read poems to him, and different teachers, especially a Mrs. Burkett at Monroe County High School who read poems, and played 33 1/3 records of great poetry. A wonderful tribute to English teachers! Cleve and his wife Shelia Hooks of Evergreen, Alabama have two children, Alana Brown Urban and Randal Cleveland. Alana is a psychometrist with the Baldwin County Board of Education and lives in Bay Minette. Her husband Steve is a Master Chief in the U.S. Coast Guard. Randal and his wife Selena live in Robertsdale. Randal is a Coast Guard veteran and farmer. He farms with his in-laws on the Waters Farm and Nursery in Robertsdale. They have four children: Madison, age 12, Jackson, age 6, Emma, age 4 and Riley, age 1. Cleveland’s dad, Alvin C. Brown, lives in the Old Salem community near Monroeville and is 99 years of age.